I'm not sure where the last month has gone, but it's definitely run away from me a bit. 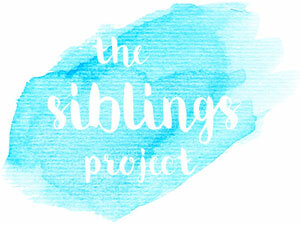 It doesn't seem that long ago that I posted my last post for The Siblings Project, and here I am again. 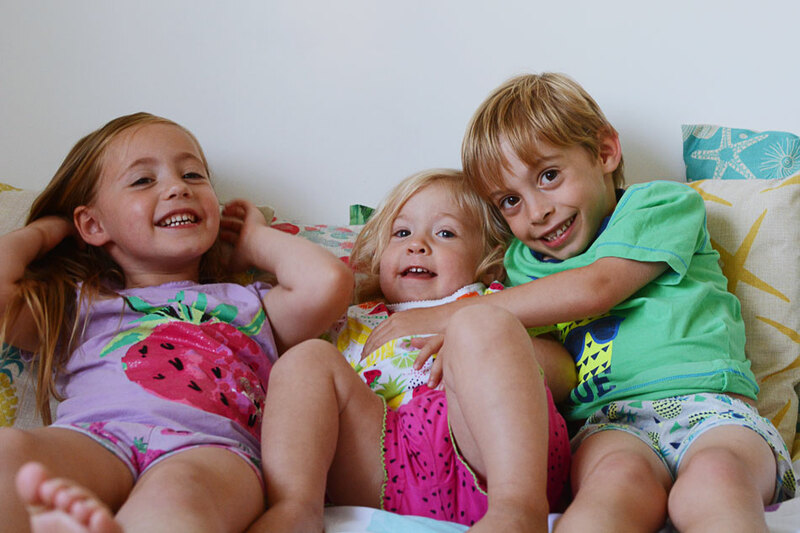 The past month has been all about fun in the sun; and my little band of adventurers are definitely happiest outside, and together, and it without a doubt brings them closer together... so I absolutely can not wait for the school holidays to finally start. Six weeks of together time and exploring and playing and fun. And probably arguing and annoying one another too, but that's all part of the sibling experience I'd say. Mostly I'm looking forward to a slowed down pace of life. I won't miss the morning hustle to get out of the door for school. And I can't wait for things to just feel a little less rushed. Like taking photos... at the last minute... when you realise you've run out of days in the week and hours in the day, and you still haven't had a chance to grab those photos you need for a post... and the kids are already in their jimjams... yeah, I am looking forward to just having a bit more time that is all ours. I think the chilled out PJ shots are lovely! Hope you all have a wonderful summer holiday! I'm with you on this month having completely run away with me - it seems no time at all since the last set of photos, and yes thank goodness for the summer holidays so we can all slow down a bit - well in my case, the kids can but I still have to go to work! - and fingers crossed for some sunshine in which to enjoy it all! I'm totally with you on the month having run away with itself - surely it was only last week we were posting June's pictures! 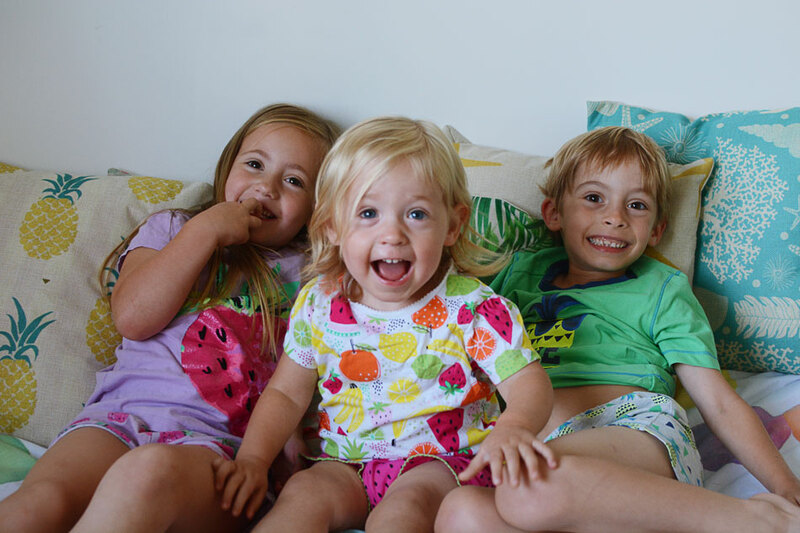 And yay for the end of term and the start of the summer holidays - I think we all need to slow down and have a few pyjama mornings, even if I then have to get up and go to work - maybe very early in the morning pyjama mornings are the answer! I am so looking forward to those relaxed mornings too and not feeling like I have definitely forgotten something! 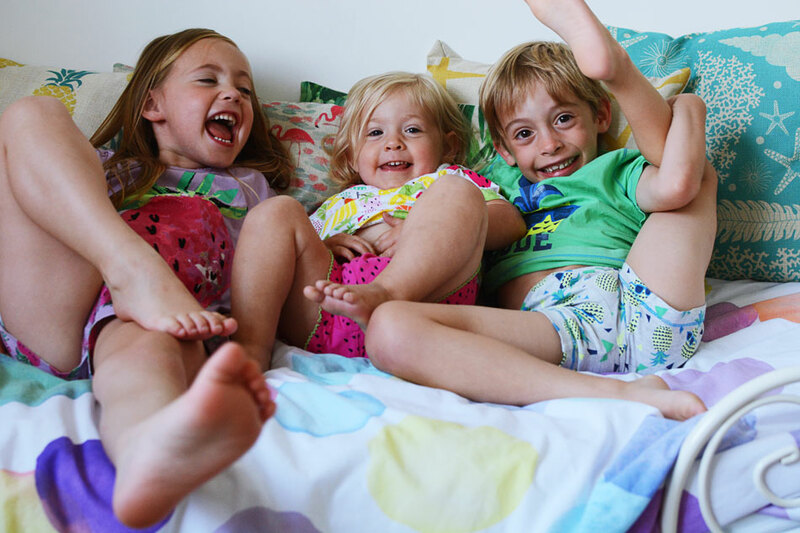 Such a fun set of pictures of your trio and they all look so summery! Hope you have a fab summer! Oh look at their outfits. They are so gorgeous here together laughing away. So much fun being had by each one of them. The time is just flying by each year faster and faster. Look at Quinny's hair here so beautiful so long all the sudden too. WOW. Hope you guys have an amazing summer. They certainly look ready for a summer of fun! We're into our third week of holidays already, and I wholeheartedly agree with the slowing down being the nicest part. Enjoy! 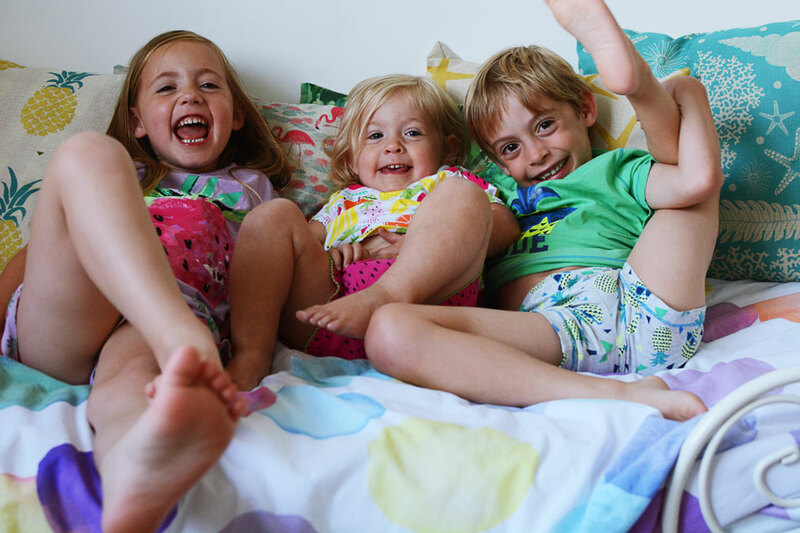 i love their vibrant coloured PJs so cute! hope you have some great summer holidays with lots of new memories to make!